Do you offer a trial? What is the advantage of purchasing a paid plan then if it's the same as a free account? Yes, you can! Your free account will have 1000 requests per day, and upon linking your Facebook account, you will be upgraded to 10,000 per day. You can already start tracking a URL's number of shares on major Social Media Networks. However, bulk is not supported on the free plan. I want to upgrade to a paid subscription, tell me more about your plans. 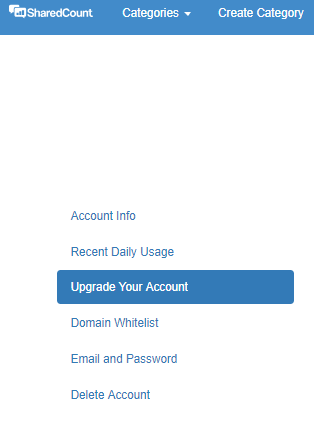 You may click on "Upgrade your account" on the left side part of the webiste after signing in. If you would go to our subscription page, you would see that we currently have three plans, Personal, Professional and Enterprise. You can choose from these three plans that would suit your needs. As soon as you're ready to subscribe, you can click on "Pay with Card". What is the advantage of purchasing a paid plan then if it's the same as a free account? Our paid plans are for users who need more volume. For example, if your site has a lot of traffic, we recommend upgrading to a paid plan to ensure you don't hit your free 1,000 requests threshold. Is there a a rate limit? There is no limit, as long as you are under your quota per day with your API key. What Happens If I Exceed My Daily Limit? 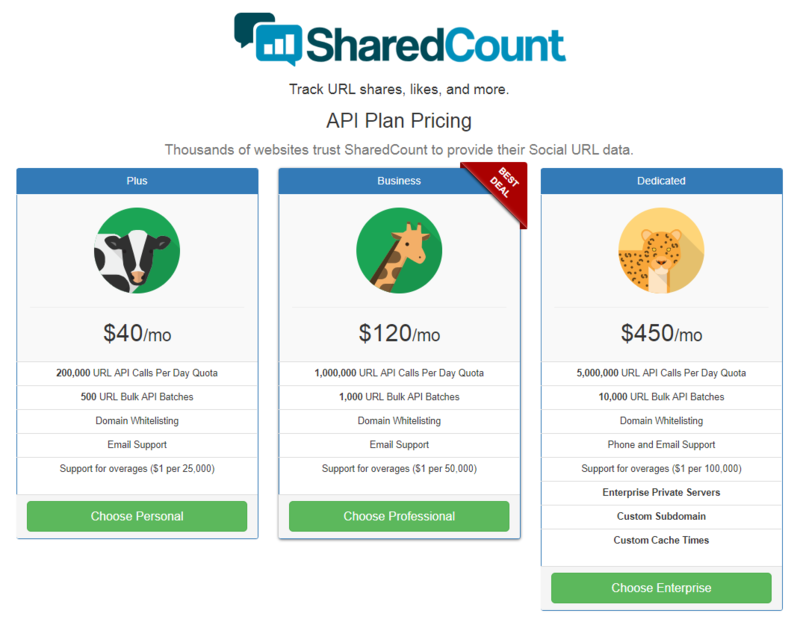 If you exceed your daily limit, SharedCount will reject your request and return a 401 'quota_exceeded' error. We will not bill you for additional payment, unless you turn on the "Overages" in your account. If you believe that you will need more quota, you can also upgrade your account beforehand. Usage resets at 12:00 AM PST every night. What credit cards are accepted. All major credit cards are accepted, securely handled by Stripe.